✔High Quality: Made of 4 shielded twisted pairs (STP) of copper wire with gold plated contact pins in each RJ45 Connector. This provides great resistance to crosstalk, noise, and interference. ✔High Speed: Supports 650MHz high-speed data transfer for server applications, cloud storage, video chatting, high definition video streaming, and gaming. Cat7 cables are the best generation. 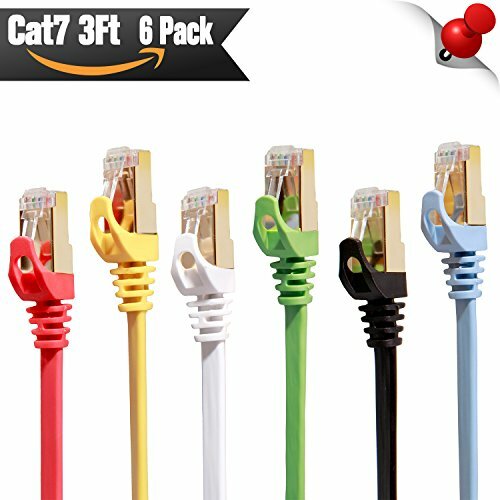 ✔High Compatibility：The Class F channel and Cat7 cable are compatible with cat5, cat5e, and cat6. Class F has less cross-talk and system noise past than Class E thanks to intelligent shielding. ✔High Neatness: A Flat cable design helps improve the look of your home or office. Flat cables are super flexible and can be run under the carpet or bent through corners or into desks. ✔High Standards: The cable is compliant with ANSI/TIA/EIA 568-B, 2-1, with up to 10 Gbps data and meets all proposed CAT-7 Requirements; Supports:10GBASE-T; 1000 BASE-T; 100 BASE-T; 10 BASE-T.